( Not my actual codes but close). 23 bucks for 2 keys , one for each bike cut to different codes . Remember seeing some people on here looking for keys and info ! Specifically these exact ones ** 1" ** in "R"
Last edited by Sprock; 07-21-2010 at 04:55 PM. Last edited by Sprock; 07-22-2010 at 08:39 PM. 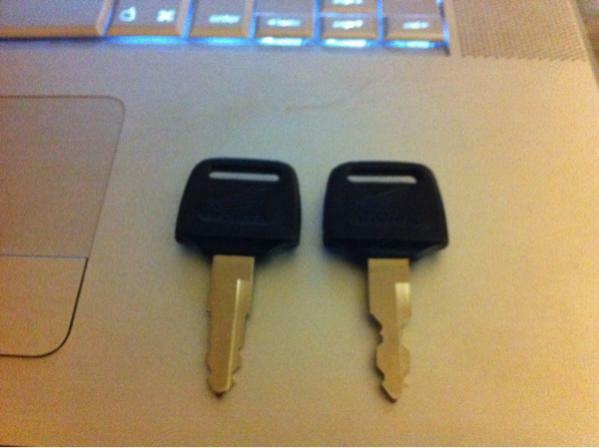 I have the two original Honda keys, but I generally just use the aftermarket one for some reason. For like $10 you can have Honda keys all over your house. Never search for a key again!! I'm gonna order a couple extra now and have them cut here. Far cheaper than the other rip of merchant I found on Ebay a while back that wanted to charge me 18 bux US to post 1 key to Australia. I must thank Trout for helping me out with getting that key to me to !!!! I had my last one of these copied by a professional locksmith nearby and it is perfect. No notchiness etc. Thanks Sprock...you've done well. I work at an ACE store and I am ordering the HD75 blanks for my self. Since we don't stock them I have to order 10. I would be happy to send anyone a blank for $1.00 each (what I pay) and postage. If more than 8 people want one I can order more blanks (keeping 2 for myself). These are blanks, I can't cut them from you key code, but any local key shop can duplicate them. We do it for free for our customers who bring in their own blanks. How many keys for a UK 954 ?